FWIW, the 18z GFS has a timing very similar to Monday’s storm: a mix of light rain/snow at 1 am, changing to all snow by 5 or 6 am, continuing moderate to heavy most of the day (which is 6 hours longer than Monday). So, if THAT is how this plays out, I see no reason amounts can’t rival Monday and stick to most surfaces like Monday. Six inches can be gone, melted in a day. I love the snow but it will melt so fast. dkodgis wrote: Six inches can be gone, melted in a day. I love the snow but it will melt so fast. April is all about seeing the snow fall and setting some records if we’re lucky. You get two or theee days of snow cover in April we’re doing good. Amugs. The NAM is showing a rain event? oldtimer wrote: Amugs. The NAM is showing a rain event? For the coastal plain yes but time will tell, we have a good cold source incoming from Canada with this from swinging through. NAM shows a lot of sleet for the region for Saturday. Well, we go from decent agreement between the NAM and GFS to heavy snow/ sleet across the area on the NAM to almost the big Goose Egg on the GFS. Positioning of the Front, Positioning of the Front, Positioning of the Front ( I sound like Nancy P ) . Where will the Front be? Hmm I dunno not go plan on seeing much here. If it happens it will if not I'm okay with that. I had outdoor plans sat and sun so not thrilled. Did models change overnight. Per Bill Evans, storm moved south, we are in upper fringes? WeatherBob wrote: Well, we go from decent agreement between the NAM and GFS to heavy snow/ sleet across the area on the NAM to almost the big Goose Egg on the GFS. Positioning of the Front, Positioning of the Front, Positioning of the Front ( I sound like Nancy P ) . Where will the Front be? Pretty good agreement for little impact north of Southern Jersey. West of Dc into central Delmarva etc will get 3-6". So 6z GFS and NAM both go south. Literally. About 50-75 miles. NAM keeps almost everything south of I-195, the GFS gives a little overnight snow Fri-into-Sat but then keeps the main precip shield south of us Saturday during the day. As always I’d wait until the next runs today. I remember Mondays storm was missing us completely to the South last Friday evening then we we ended up in the jackpot zone two days later. Wow, that's a huge shift south! Lee Goldberg says after the 12th we torch , so these last events will be the end of the show. docstox12 wrote: Wow, that's a huge shift south! Lee Goldberg says after the 12th we torch , so these last events will be the end of the show. I see about a 4-5 day warm up before going back to normal for a bit. as long as it's normal which should get into 60s at least. Torch as in 70s or higher? It's funny 00z gfs had a mothrazilla and now u guts are saying nothing. Off of one run? Are we now living and dying by one run? Sorry, but 60s is still above normal this time of year. Even for the heat island of New York City the average high temperature for the day doesn't hit 60° until April 12, even by April 30 the normal high temperature is only 68. I know most people like to think of April as a warm month but historically it's just not the case. The average high temperature doesn't even hit 70° in New York City until May 11. Now of course there are stretches that exceed the normal as there are stretches like now that are below normal. Saturday:Snow likely before noon, then rain and snow likely between noon and 4pm, then rain likely after 4pm. Cloudy, with a high near 38. Northwest wind 9 to 14 mph. Chance of precipitation is 60%. New snow accumulation of 1 to 3 inches possible. Saturday Night:Snow likely, possibly mixed with rain before 9pm, then a chance of snow. Mostly cloudy, with a low around 26. Chance of precipitation is 60%. New precipitation amounts of less than a tenth of an inch possible. Looks like 12z NAM is coming north. Yep 12z NAM is north of 6z run. Not a dramatic shift, but a clear shift north. 6z had northern extent of snow south of a line from Philly to AC at 8 a.m. Saturday; the 12z run has it up to I-78 into Long Island. 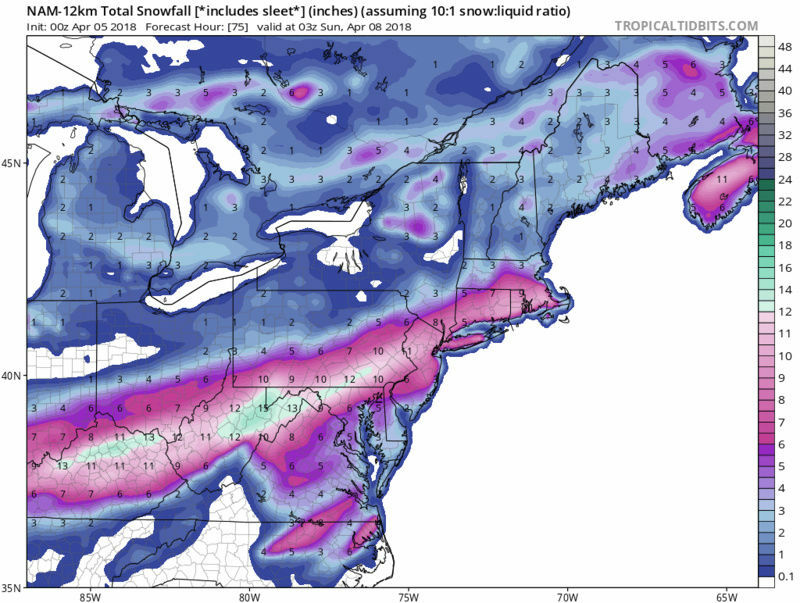 Heaviest band would still be across Del, SEPA, and SNJ, but it is a shift back in the direction of yesterday's models, so lets see if that is the start of a trend north (as we've seen often of late) to continue north in the 18z runs, or if it is an isolated or final shift.